What were your expectations going into this season? I've been pretty clear that I thought we'd be 8-4 or so. I based that on a few things: new defensive schemes and the youth on that side of the ball; QB play; and offensive line depth. As a bonus, I was worried about injuries in the running back corp that would limit how we used them in close games. By my view, all three weaknesses were on display Saturday, with the added bonus of us being down to two backs. Before we go all fire [FILL IN THE BLANK WITH EVERYONE BUT PRUITT] mode over losing to a bad Florida team, I think we should see how they finish the year with Harris at QB. It is clear that they found something to spark their offense. If they sustain that for the rest of the season, this loss won't look the same in December. Their defense was and remains very stout. We saw that on display, especially in the second and third quarters. I hate losing to Florida more than I hate losing to any other team. I firmly believe that we have something, somewhere that contributes to, but isn't the only cause of, head scratching losses each year. But truth be told, every program but one or two a year has those losses. Does that change how maddening it is for us that we have one each year? No. I suspect some of those in the fire Richt camp would feel the same way if we went to the National Championship, only to lose by one point to another undefeated team. Some of those in the Richt shouldn't be ever held accountable camp would feel that way if we were 0-12, because he is a good man. In reality, there is a middle ground occupied by most of us that want championships, but see that there is more to excellence than just championships. The problem lies in where that point is, and those decision makers that view excellence more by dollars and perception than wins and graduation rates. I couldn't agree more. There were certainly some alarming things about the loss on Saturday, and the recent history in the rivalry is frustrating, but taken at a macro level, the season is still pretty successful. If, before the season, we had been told Georgia would have 2 losses right now despite losing Gurley (not to mention half the secondary), we would have pumped our collective fists. Who honestly thought we were a national title contender, anyway? Let's beat Kentucky, ruin Auburn's season, stomp Tech, and call it a success. Next year is year 2 of Pruitt's defense (presumably), and we'll have Michel and Chubb toting the rock. Expectations should tick up. What I can't fathom is how we lose so much focus on BYE weeks. What are we doing on the BYE weeks that is causing us to go from one of the best teams in the country one game, to a pathetic effort a game later? Every year we fall victim to the same thing which is showing up massively under-prepared and unfocused once or twice. Yes, almost every team has the heart-breaking loss that takes away their national title chances, but it's usually a well fought game that they just didn't come away with. When Georgia has those losses, it's always a game where we come out and just lay a giant egg and play horribly. How does it keep happening? "there is more to excellence than just championships." Wrong. There is good, but there is no excellence without championships. That is the mindset that is all too a familiar theme in UGA nation. Good wins the SEC east. Great wins the SEC title. Excellent wins it all. And what will be the excuse next year when we drop another game incomprehensibly? "I firmly believe that we have something, somewhere that contributes to, but isn't the only cause of, head scratching losses each year. But truth be told, every program but one or two a year has those losses. Does that change how maddening it is for us that we have one each year? No." This pretty much sums up where I am with all this. Some folks act like we're the only program with this "head-scratching losses" disease, but on any given Saturday you're going to find a number of top tier programs saying the same thing. That certainly doesn't make it any better as a fan, but if you're in the group looking at coaching alternatives, there aren't more than a couple of programs to pluck from that would legitimately be an upgrade in that regard. Why Georgia can't seem to give Florida their A-game (even in years where they win) is a fair question, but the bye week isn't the problem. The only time we gave our A game against florida was 07 when we literally and figuratively stomped on them. You're right. Totally forgot about the weird week 2 bye. My fault! You haven't ever really succeeded at anything, have you? I don't think anyone would call Gene Chizik excellent. Hmmmm, in August I said the same thing: 8-4 with an outside shot at going 7-5. My reasoning for such a potentially dismal season was right in line with what you stated above. 1. I think we have the right staff in place, so the next logical place to focus on is recruiting. We have talent, but we're not elite in enough in key positions. 2. We can start recruiting by focusing on Defense where we have serious issues at every level, the most glaring of which is DB. Losing McFadden to F$U in the 2015 class hurt - bad. Next we've got to focus on ILB, glaring weakness with not a lot of talent waiting in the wings. Then of course we need some larger more talented bodies up front. Overall, we need a significant upgrade in talent on the defensive side of the ball. I'd like to start seeing us recruit more Pollack types. Guys that can keep the emotions in check and provide real on field leadership. Leading by example. 3. Jason Eason can't get here fast enough. I have serious doubts about the level of talent we have in our stable of QB's. 4. Can we ever land a 5 star Left Tackle? This needs to be a major focus area for the offensive staff. Need to also recruit a big body at Center. In fact we need an upgrade across the board. 5. Need help at WR, too many guys hurt and not enough talent backing them up. It should be very apparent... if we want to get into the playoff system we need to recruit more talent, then COACH them up to full potential. You make an assumption that I meant excellence could be achieved without championships. You are wrong. I was pointing out that winning championships don't always mean you have achieved excellence. I was specifically thinking of Miami under Erickson, Southern Cal, and Gene Chizik's Auburn when I typed that. I want a championship, but don't think it is worth breaking rules to win it. If that makes me whatever pejorative term is du jour, then so be it. 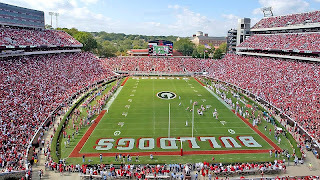 The bigger point is that there are Georgia fans that don't care about breaking rules to win it, which in my view makes them selfish. There are those (I believe some in BMHH) that find going out the way to be the goodest to be true excellence, even if that means not winning a championship. As you can tell, I'm in the middle. Ok thats fine, but nobody ever said anything about cheating or violating rules, etc. Everything that is wrong with us as a program is fixable within the confines of the rules. We clearly have everything necessary to compete with, and win against the biggest programs in the country. 2007 proved that, as did 2008. All the talent in the world-no shows when it counted. Since we all agree that is the case, the mindset/attitude is what needs to change. Harbaugh turned a lollipop Stanford program into a national power, and his personality and coaching style had a lot to do with it. I'm here in Houston, and every week at the alumni chapter the conversation is the same here as it is in Atlanta and everywhere else-those who say "who ya gonna get" vs "we can do better." Its been 9 years since we've won an SEC title. If we don't demand excellence we're never going to get it. And by excellence, I mean consistently competitive. Not wipe out mizzou, lay an egg vs florida, and then say "oh well next year and by the way CMR is a good man so give him a break." Florida,A large part depends on the birth champion coach's tactics! Well, your post made it sound like we haveb een losing after the bye for years. It has only been this year for some reason. Richt has won nothing of substance in the last ten years with rosters full of NFL talent. He needs to retire or go preach somewhere. It sure will we have read these excuses for 10 years and they will continue for another 10 It' hopeless. Thank GOD Richt is not black or we who don't like him as a coach would be titled racist!